Say cheese for 3D-Printed Selfies, a 3D-printed action figurine of, well, you, available this Friday at the Art of 3D Printing party at LMNT. If you’ve ever wanted your own likeness to grace a Monopoly board or needed a stand-in for vacation photos, consider this an early holiday present. Thanks, technology. Now, as with most monumental life events, it’s important to be prepared. Allow us to help. 1. RSVP for the Elixir party. You can do that here. 2. Outfit strategizing. Yes, the cape/cravat combo is a bit much. 3. Head over to LMNT around 5ish on Friday and bring along anything you’d like to have immortalized by a 3D printer. A significant other, a friend, your pet iguana. You get the point. 4. 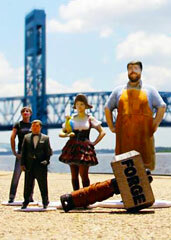 The fine folks of Forge 3D will perform a 3D body scan of you (or your friend, iguana, etc.) and print out the result on the spot. 5. Collect your figurine. Make your way to the bar. Mini you will have what you’re having.